More than simply a series of chapters on the theology of John's Gospel, Jesus is the Christ relates each of John's teachings to his declared aim, expressed in John 20: 30 - 31: "Jesus did many other signs before his disciples, which have not been written in this book; but these have been written that you may believe that Jesus is the Christ, the Son of God, and that believing you may have life in his name." Indeed, each chapter in Morris's book takes up some facet or aspect of John's expressed aim. For an age that is still asking the question "Who is Jesus?" Leon Morris argues convincingly that John's entire gospel was written to show that the human Jesus is the Christ, or Messiah, as well as the Son of God. But it is Morris's firm conviction that John's purpose was evangelistic as well as theological - that is, John wrote his book so that readers might believe in Christ and as a result have eternal life. Though Morris had previously written one of the largest and most comprehensive commentaries to come from the evangelical community in recent decades (The Gospel According to John, 1971), the questions and comments of his seminary students stimulated him to even further study and reflection and instilled in him the desire to write something solely on the theology of John. The result is this work, which offers new and sometimes surprising insights into a key passage and a pivotal book in the New Testament. Leon Morris (1914-2006) retired as Principal of Ridley College in Melbourne, Australia, in 1979. He is the author of more than forty books, including The Apostolic Preaching of the Cross, the volumes on Matthew and Romans in The Pillar New Testament Commentary, and the volumes on Johnand the Thessalonians epistles in the New International Commentary on the New Testament. 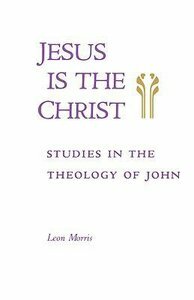 About "Jesus is the Christ: Studies in the Theology of John"